and black armbands and offering expressions of support. 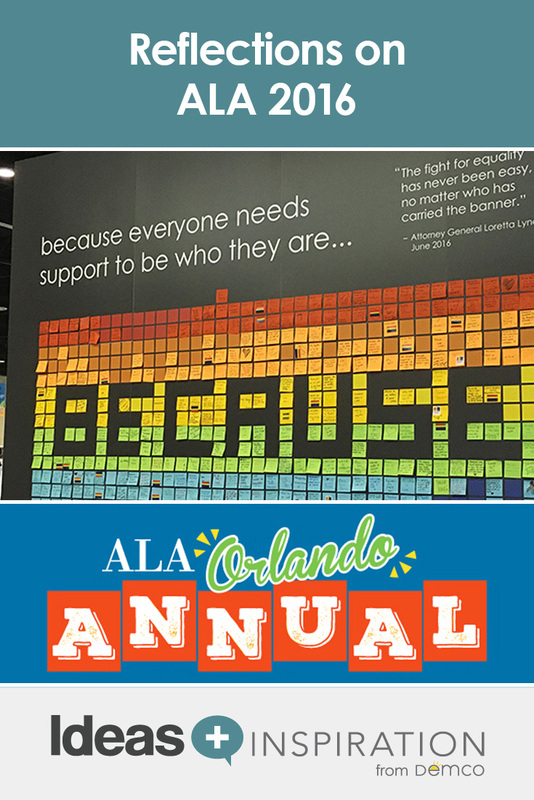 A feeling of solidarity and inclusiveness was strongly felt at the 2016 ALA Annual Conference in Orlando, with library workers coming together to focus on new ways they can assist those in need and best serve the diverse populations that make up their communities. During the panel presentation “Listening to our Customers: Trustees Becoming True Community Representatives,” representatives from the Dallas Public Library (TX), Jacksonville Public Library (FL) and Skokie Public Library (IL) focused on the theme of “turning outward” to the community to understand their needs and advance their communities’ agendas. It was interesting to learn how trustees and friends groups are not always aligned with the library’s mission and can sometimes operate autonomously. Often friends groups serve a specific library branch without common leadership across the system. Dallas Public Library addressed this by using local and national data, charts, stats and context to build a common understanding among the groups and libraries in their system. Once the stakeholders learned how they ranked when compared to similar size cities, the community and library advocates swiftly took action to restore much-needed funding by designing the campaign Open Libraries Unlock Potential. In Jacksonville, the staff focused on their community by developing and implementing a system-wide customer service model, “Get to Yes.” This new model emphasizes listening to learn and puts the customer first in all interactions — a philosophy that extends beyond the library, with staff attending community meetings and events. Skokie has been actively using the Harwood Institute’s method of Turning Outward, a forward-thinking mindset that promotes listening and taking action in collaboration with the community on the things that matter most to them. Other sessions focused on evaluating the effectiveness of the library’s events. Texas A&M library staff delivered a high-value, accessible session, “To Surveys and Beyond: Strategies for Assessing Large-Scale Outreach Events.” The presentation focused on one of their six core areas of focus: Outreach and Engagement Coordination, an area that makes connections throughout campus and into the community. The underpinning of A&M’s approach is quite simple: Know why you’re doing what you’re doing because you can’t assess what you don’t define. This team knows the limits of assessment tools and aligns their methodology to each event, amassing qualitative and quantitative data that they can then incorporate into their storytelling with constituents. Two examples they shared stood out because they are the types of events that are often the most challenging to assess. During their most recent Gig ‘Em Week Open House, which is held at the library the week prior to classes starting, the A&M staff had 4,280 students come through the library in 3 hours. The goal of the event was to help students realize librarians are not scary and reduce student “library anxiety.” Three months into the school year, the staff compared survey data of attendees and non-attendees of the event to assess impact. A&M’s disciplined approach includes having a designated leader for all events who is responsible for setup, taking photos and transferring data and information into a Google Doc for future reference. Helping users navigate the library was also a topic of focus. “Where’s the Restroom? Tips for Effective Library Wayfinding” was chock full of examples and imagery encouraging libraries to rethink their signage to “radically improve the user experience.” Susan Flannery of Cambridge Public Library (MA) shared their signage plan, which focused on building a community connection. Their signs feature local citizens and common language that speaks to “normal human beings.” Wendy Tressler of Columbus Public Library (OH) created a holistic, yet scalable signage system for libraries from 6,000 to 255,000 square feet. There were several great points made in the session (watch for our expanded blog post on signage, wayfinding and user experience in August). But for now, keep this advice forefront in your planning: A first impression is a lasting impression, and signs that contribute to visual clutter are not well-received. Along with assisting patrons in navigating the library’s physical spaces, libraries are also looking at ways they can better market their services to their community members. Traditionally, libraries have not been able to capture a clear view of who their patrons are and all of the ways they are interacting with the library. In the session “Marketing the Value of Your Library,” Consultant Tom Jackson discussed using data, not only to better serve patrons, but also to better market and target services to the right patrons. Jackson outlined how libraries can use marketing automation services such as Hubspot or Marketo to gain a broad picture of patron activity, including how they navigate the library’s webpage. Libraries can then personalize and target the messages they send to each patron. In addition, Patrick Sweeney from EveryLibrary indicated that developing relationships is key to increasing engagement. Being relevant to your target audience is part of developing a relationship with that audience, and tools such as Facebook can be used to send targeted messages. Libraries can boost posts or purchase social media ads inexpensively and direct them toward community members who are most inclined to need and respond to the information. Makerspaces continue to be one of the most talked about topics, both in sessions and on the exhibit floor, where attendees got to see all types of engaging tools and options for creating flexible creation spaces. In the Makerspace Pavilion in the exhibit hall, attendees had an opportunity to get hands-on training with codable robots, circuitry, building tools and art projects. Attendees were also able to build up their toolbox of STEM resources with all the great ideas shared in sessions, such as “Stellar Hands-on STEM Learning Resources,” which provided another opportunity for participants to try out some of the popular STEM tools and created a solid connection to learning and getting students ready for the higher ed learning environment. In the “LITA Top Tech Trends” session it was emphasized that the makerspace trend is “about making makers, not spaces.” This idea encourages librarians to create spaces as they’re needed with mobile makerspaces that can go anywhere, inside or outside the library. In addition, they noted that making activities promote an essential shift in mindset from “I can’t get this to work” to “How can I get this to work?” This new attitude promotes critical thinking skills that transfer well to the classroom and future success in the workplace. In her standing-room-only session “This Is What a Maker Space Looks Like,” Heather Moorefield-Lang gave attendees a whirlwind tour of makerspaces (a broad term including anything from maker activities to high-tech spaces) she has visited around the world while doing qualitative research. Makerspaces can take many forms, she said, from shoeboxes filled with themed tools to expansive spaces with high-tech tools. Moorefield-Lang stressed that there is no magic formula for what a makerspace should look like, and it’s important to gain an understanding of what the users want out of the space, including the needs and interests of community members and how the activities tie to learning standards in school settings. Makerspaces are just one of the physical changes taking place in libraries. In the session “Top Library Building Trends,” the panel of architects, librarians and consultants spoke about the most up-and-coming trends in library spaces, including taking advantage of or even creating green space. In order to develop more places for community members to gather, many libraries are utilizing outdoor, and sometimes indoor, spaces for community gardens and greenhouses. The spaces not only serve as intergenerational places for members to gather and collaborate, but also extend into gardening, cooking and healthy living programming. Other building trends focused on a not-often-mentioned space: the bathroom. Trends included gender-neutral bathrooms, communal wash areas and full-height partitions to offer more privacy. Libraries are also modifying the way they present their collections, from doing intensive weeding in order to clear space for new initiatives to modeling their merchandising after retailers to reworking their Dewey systems into genre classification systems. In addition, libraries are expanding the way users access books by utilizing alternatives to traditional library buildings, including vending machines that dispense books in lower-served areas or in high-traffic public areas, such as subways, airports or grocery stores. There were, of course, many other great topics touched on at ALA 2016 Annual, and as we head back into our daily responsibilities, the wheels will continue to turn. 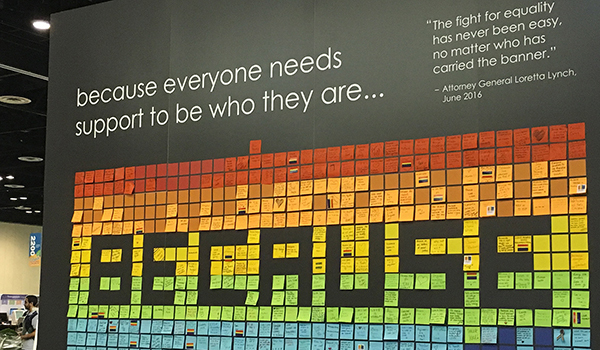 We’ll take what we learned and begin applying it in our own roles, with a heightened perspective that librarians are truly champions of equality and education in our communities.